''Coral Fish'' is an example of John Nelson''s light and spontaneous style. 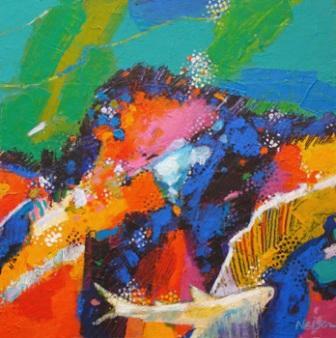 The small white and yellow fish stands out against the dramatic backdrop of very brightly coloured corals and seaweed. The clear brushstrokes add to the sense of urgency and excitement one feels vicariously on behalf of the artist. The warm palette chosen by John Nelson for this painting adds to the sense of life and enjoyment he obviously feels towards his subject. In addition to Red Rag Scottish Art Gallery John Nelson has exhibited at other leading Scottish Art Galleries. John Nelson paintings have also been exhibited extensively in many mixed art shows in Dublin, Netherlands, Belgium, Paris and Canada. Each painting at Red Rag is sourced from the John Nelson artist studio and like all Red Rag Scottish art and Contemporary art it can be shipped worldwide. Click here to view more contemporary paintings by John NELSON.